Ground Penetrating Radar Systems’ office in Nashville, TN recently worked with a local plumbing company to help them locate several areas suitable for core drilling through an elevated concrete slab. 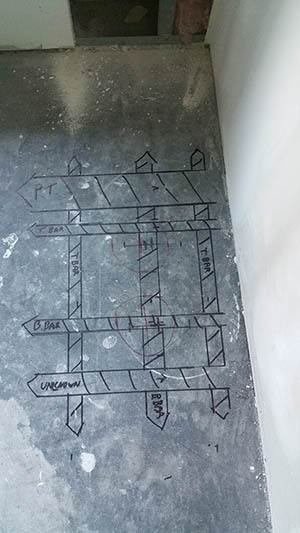 Working in a new residential building in the Wedgewood area of Nashville, a plumbing company needed to re-position several proposed core drilling locations to accommodate drains and water lines for kitchen and bathroom amenities. Many of the current locations were in or under existing walls and/or beams, making the prospect of coring in these areas very difficult. Rather than accept this risk or expend extra time and resources to have the site plans revised, the plumbing company coordinated with GPRS to scan the proposed areas and mark out rebar, post-tension cables and conduits directly on the slab. GPRS worked to troubleshoot the locations and, when necessary, advised moving the drilling locations to lower-risk areas. Fast and accurate, the GPRS scanning method prevented any further delays to the project that would have been caused if the plans had to be re-engineered and re-designed in order to reduce risk of striking reinforcement in the slab. Scanning and interpretation are in real-time, so project managers can instantly receive results, relay them to their team members, and make necessary adjustments on site without causing any delays. GPRS uses non-destructive testing equipment to locate piping, post-tension cables, reinforcement, and conduits within the slab that are otherwise unable to be seen. Using GPRS is a safe, efficient, cost effective way to make sure you can safely drill or saw-cut and not destroy any conduits, rebar, post-tension cables, or other anomalies in concrete. Other services we offer are: Underground Utility Mapping, Underground Tank Location, Concrete Analysis, Rebar Mapping, Void Location, and more. GPRS is a nationwide company with local project managers in over 50 cities. If GPR services are needed in Central Tennessee, contact Casey Barefield at (615) 418-4023 or casey.barefield@gprsinc.com. Also visit www.gp-radar.com for a directory, to view important information about our company, or request more information about how we can serve you on your project.